Elder Bartley comes out swinging by accusing CTS adherents of believing that they are "wise above all the fathers." This common tactic seems to discount the possibility that some of the fathers may stand in need of correction and that subsequent generations may be more diligent with respect to spiritual truth than their predecessors. One need look no further than the book of Galatians to find an example of some early "fathers" who very much stood in need of doctrinal correction. All that really matters is the validity of the bible's teaching on the matter, not the traditions of the fathers which are prone to vanity and error, but rather than belabor that point, let us examine the specifics of Bartley’s objections to CTS in light of the scriptures, our only rule of faith and practice. That’s a pretty grand setup. Suffice it to say that when men promote the truths of the word of God in a wicked world where many false ideas have taken hold, that the preaching of truth may have a dividing quality among the flock to the degree that many resist it. But neither mere observations of division nor church history are sufficient to establish the matter of truth. We must examine the claims of CTS in light of the scriptures and if it is true, we should promote it as the truth whether it divides or not. "Salvation" is "One Single, Simple Word, Never Plural, Complex"
Bartley's casual declaration that “salvation” is a "single, simple word" is an unsubstantiated assertion that does not establish that the word "salvation" has a simple and singular meaning in scripture. It is evident from any sober reading of the word of God that Bartley's assertion is not true, as "salvation" and its variants are used in numerous ways in scripture to describe events with temporal consequences such as the parting of the Red Sea (Exodus 14:13) as well as events with eternal consequences such as Christ's authorship of eternal salvation (Hebrews 5:9). More on this important aspect of rightly dividing “salvation” in a minute. 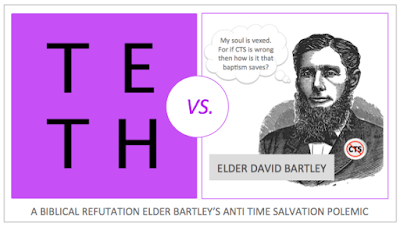 "The Plural Word 'Salvations' Is Not In The Holy Bible"
Here Elder Bartley sets forth a pedantic technicality that does nothing to sustain his anti-CTS argument. Absence of the plural word “salvations” in scripture is no proof that there is only one salvation spoken of in the bible. I might say, “Jesus saved my soul,” and later state, “I saved 20% at Bed, Bath, and Beyond,” but the fact that the plural word “salvations” is absent from those statements does not prove that I am speaking of only one "salvation." The context of my remarks establishes that I am speaking of more than one salvation, not the presence or absence of plural terminology. What's more, the bible speaks of God sending "saviours" in the plural (Nehemiah 9:27, Obadiah 1:21). This creates an enormous dilemma for Elder Bartley's assertion. If there is only one salvation in the word of God as Bartley insists, then what "salvation" were these "saviours" sent to accomplish? If it is the one salvation that includes our eternal state in glory, then one has embraced the blasphemous atrocity that Christ alone did not accomplish our eternal salvation, but rather did so in conjunction with a host of other "saviours." It should be obvious that this position is completely untenable. It follows that there must be some sense in which men may be "saved" in this lifetime other than the eternally saving work of Christ, and that the "saviours" of Nehemiah were instrumental in that salvation and not to eternal salvation. So the existence of "saviours" (plural) proves the existence of "salvations" (plural) in the word of God by unavoidable logical consequence. If Elder Bartley insists that there is but one salvation in the bible, then he must admit that there are multiple "saviours" involved in that one work. This position is an assault on the singular, high-priestly office of Christ and salvation by sovereign, monergistic grace, and must be rejected on that basis. If, on the other hand, Elder Bartley develops some means of explaining how these "saviours" existed and fulfilled their saving office, yet Christ alone is the Saviour of men, then he violates his insistence that the topic of salvation is "simple" and that it is "never... complex or compounded" and in so doing undermines his own argument. Simply put, Elder Bartley's premise that the absence of the plural word "salvations" establishes that there is only one salvation taught in the bible is insufficient to bear the weight of his anti-CTS argument and this is its undoing. Bartley Objects to ANY Salvation that is "Conditional" or That "Rewards"
Let's take a look at a three passages of scripture that dismantle Elder Bartley's coarse statement. 1. There is a salvation in view in this text. 2. This salvation is not eternal deliverance unto immortal glory. 3. This salvation is conditioned upon man’s willing obedience. 4. There is a reward in this lifetime for that obedience. 2. It is not eternal deliverance unto immortal glory. 3. This salvation is conditioned upon man’s obedience. While those two texts are compelling in establishing the doctrine of CTS, we recognize that there are those who might reject all of those observations simply because no form of the word “salvation” is explicitly present in those texts. While this is an irrelevant technicality, it is not difficult find scriptural examples that invalidate all such objections. Consider these words from the apostle Peter: “And with many other words did he testify and exhort, saying, Save yourselves from this untoward generation.” (Acts 2:40) Now here is a place where regenerate, believing men are admonished to “save yourselves." Given that Christ explicitly taught Peter that with men eternal salvation is “impossible” (Matthew 19:25-26) then it is a bald logical contraction to insist that the “saving” that Peter has in mind is eternal deliverance unto immortal glory. Indeed the “saving” Peter has in mind is explicitly spelled out for us in this text. It is not salvation from eternal damnation in the lake of fire, but saving from this untoward generation. Peter is speaking of the salvation that comes as a result of bringing forth the answer of a good conscience by the resurrection of Jesus Christ found in the waters of baptism as well as the deliverance that a regenerate child of God experiences by turning from sin and error to embrace the truth and live in accordance with it as they ought. The scripture passages that Elder Bartley rallies to his support (Romans 4:4, 11:6) are all made in reference to ETERNAL SALVATION from the eternal consequences and condemnation of sin. We do not disagree that where eternal salvation is concerned, it is entirely of grace in such a way that works are explicitly excluded (Ephesians 2:8-9). In fact this is absolutely central to our doctrinal position. What Bartley repeatedly does, however, is attempt to cast the CTS position in a negative light by insisting that we apply CTS to passages that deal with eternal salvation. That is a gross misrepresentation of the CTS position. This he does so repeatedly in his article that it calls either his understanding or honesty in dealing with CTS into question. 1. The eternal life imparted to a child of God has among its purposes the performance of good works (Ephesians 2:10). 2. Those good works are synergistic acts of God and man given that God’s promised provision for doing good is ever-present (I Corinthians 10:13) and such good works do not come to pass apart from man’s willing and active participation therein (Isaiah 1:19). 3. It is for this reason that the bible regularly and repeatedly exhorts men unto good works and unto the mortification of sin in their lives. This is demonstrated in Peter's exhortation at Pentecost, “SAVE YOURSELVES from this untoward generation.” (Acts 2:40). 5. This temporal salvation has absolutely NO BEARING on a child of God’s eternal state of grace (eternal salvation) but rather has a great deal of bearing on the quality of his life, his discipleship, the profitability of his example before others, and the degree to which he avoids the temporal consequences of sin’s practice in this lifetime. Consider this: If a regenerate man chooses to be faithful to his wife, will he not be saved from the devastating temporal consequences that practicing adultery would visit into his life? Clearly such a blessing is available to him and it is conditioned upon his obedience (Exodus 20:14, Ephesians 5:25). Now, if he chooses to commit adultery, even as King David did, will he experience salvation from the consequences associated with the adulterous practice of this untoward generation? Clearly not, even as David did not experience that salvation as a result of his own adulterous behavior (II Samuel 12:10). The salvation that David missed out on due to disobedience was not his eternal salvation. He referred to his eternal salvation as being the result of an everlasting covenant that is ordered in all things and sure (II Samuel 23:5). It follows that David’s disobedience caused him to miss out on the salvation from this untoward generation he could have experienced had he chosen to obey God where Bathsheba was concerned. So to state that very plainly: while the blessing of eternal salvation is conferred upon an object of mercy based entirely on monergistic grace apart from any works or effort on the part of the beneficiary whatsoever, the blessings of obedience in discipleship for one who has already passed from death unto life are NOT conferred in the same monergistic fashion wherein man is a mere passive beneficiary. Man's obedience in discipleship does not work the same way as his regeneration from death unto life. In the latter, he is utterly passive and his works are not involved; in the former his willing and active participation is required. As such a regenerate man’s obedience is a synergistic act of God and man by definition, not a monergistic act of God alone. To suggest otherwise is to drift into the error of HyperMonergism. I’ll state briefly here that the position that Elder Bartley is staking out here is similar to a belief that I have encountered among some sovereign-grace-professing Christians that I refer to as HyperMonergism – the belief that since eternal salvation is monergistic, that therefore everything in the life of a child of God is monergistic. It is a denial of synergism in the life of a child of God. In my experience, the reason that some stake out this position is due to the fact that they have carelessly embedded man’s works (i.e., righteous things that regenerate men do) into the work whereby man is eternally saved, at least in some sense. Thus to prevent their scheme of salvation from being justly accused of synergism, they must insist that our works are also monergistic acts of God. The proper way to resolve the dilemma, however, is not to posit the daffy, language-defiling solution of declaring synergistic acts of men as monergistic acts of God, but rather to recognize that man’s works have absolutely no participatory involvement with the work whereby man is eternally saved and thus the fact that they are synergistic does nothing to alter the fact that eternal salvation is monergistic. This too is a very coarse handling of our position. Elder Bartley would do well to redouble his efforts at understanding the CTS position because the case he sets forth is a crass caricature that opens him up to the accusation of employing a straw man argument or failing to adequately understand the CTS position he opposes. We do not believe that eternal salvation calls for works to obtain it. In fact we insist that works are excluded from it. It is for this very reason we insist that when we see a conditional scheme in the scriptures that requires man’s willing and active conformity to those conditions, we must recognize that the "salvation" in view is something other than eternal in nature. Moreover, since the gospel deals primarily with the message of the finished work of Christ in saving his people from their sins, eternal salvation therefore is not conditioned upon man’s works at all. The exhortations to obedience that attend the gospel message are not in order to acquire salvation but admonitions to act as one ought to act as their reasonable service to God, given one's belief of gospel truth (Romans 12:1). But it is essential to note that no one is ever eternally saved by acting as they ought. We are eternally saved by grace, which means we are saved in spite of the fact that we have not acted as we ought. Nevertheless, a regenerate child of God, who is passed from death unto life, may save himself from this untoward generation by acting as he ought in obedience to the precepts of God and in so doing be delivered from the devastating consequences that accompany the commission of sin in this lifetime. "All Conditionalism is a Denial of Salvation by Grace"
God’s eternally saving grace is most certainly unconditional. It is conferred upon those who are dead in trespasses and in sins and who were totally incapable of contributing to that work at all (Ephesians 2:1). But the grace of God whereby a child of God may obey the Lord in discipleship is an ever present provision (I Corinthians 10:13) and one benefits from it only to the extent that they willingly and actively obey God. So again, what Elder Bartley is doing here is building his argument against CTS by conjoining things that CTS doctrine insists the bible will not allow us to conjoin. The irony is that Bartley's reasoning thoroughly underscores the biblical basis for rightly dividing the topic of salvation per CTS doctrine and reveals that his refuge of functional HyperMonergism arises from the embedding of man’s works into Bartley's single salvation. Since there is but one salvation in his scheme, he posits the goofy notion that such works are actually monergistic acts of God lest his system resolve to synergistic eternal salvation. Obedience is a synergistic act in that it requires one’s willing and active participation in order to come to pass. This means that while obedience to God is “of the Lord” it is not “of the Lord” in precisely the same sense as our monergistic eternal salvation is said to be. Eternal salvation is “of the Lord” in the sense that God does all of the work. Time salvation (our temporal obedience to God) is “of the Lord” in the sense that apart from God’s having FIRST given us of his Spirit we would remain utterly incapable of obeying God by faith. That is a very important distinction and it is required to avoid the crass error of HyperMonergism that is increasingly becoming the view of many so-called "sovereign grace" Christians in our day. Eternal salvation is redemption and deliverance from the wrath to come. Temporal salvation is deliverance from this untoward generation during one’s natural lifetime. The key question to ask here is - Does the eternal salvation wrought by Christ at Calvary provide the same and certain level of deliverance from the practice of sin in this lifetime as it provides from the wrath to come? A sober answer to that question is a step toward affirming the distinction between unconditional eternal salvation based solely on the work of Christ, and Conditional Time Salvation from this untoward generation which requires man's willing and active participation in the form of saving himself (Acts 2:40). It is readily evident that the eternal salvation wrought by Christ at Calvary does not guarantee timely obedience in discipleship in the same way that it guarantees redemption and that distinction is foundational to CTS doctrine. Salvation in the mind and purpose of God has its origins before the foundation of the world, not in the created domain of time (Ephesians 1:4-6). That said, most of the events involved in our eternal salvation do occur in time (incarnation, substitution, redemption, sacrifice, resurrection, regeneration, etc.) even as do the events involved in one’s time salvation (obedience, blessing, discipleship, fellowship). But it is VERY important to note that while Christ's work ensures that all of his sheep will be regenerated without exception, it does not ensure that all of his sheep will exhibit the same degree of obedience to God during their natural lives to the same degree of certainty. The evident differences in the lives of Daniel and Lot, or John the Baptist and Solomon make this a matter of no controversy whatsoever. Diligent and consistent obedience to God in discipleship is not a matter of certainty to the degree that God's monergistic works of regeneration and redemption are. Thus the scriptures regularly exhort men to obedience in order that they might though obedience save themselves from this untoward generation. Here Elder Bartley presses an unnecessarily rigid definition of “lost” into the argument. There are many ways that one can be “lost” and not all of them design “dead” or “incapacitated” with respect to finding the way. Anyone who has spent time in the woods can relate to the idea of being “lost” (i.e., not knowing where one is or the right direction to go) but this does not mean that they are utterly without capacity for rectifying that situation provided they consistently apply the navigational precepts they have learned. So while an unregenerate man may be said to be "lost" in an abject sense (II Corinthians 4:3), nevertheless a regenerate man may be "lost" in this world at times because they have failed to follow the admonitions of the word of God. But such a man most certainly can find his way back in this lifetime through the spirit’s enablement, repentance, and obedience (Luke 15:18,19,24). This is part and parcel of the Christian walk. The bible plainly sets forth blessings for obedience (Isaiah 1:19). We should not shy away from that concept nor that such blessings constitute some form of salvation or deliverance from the consequences that would otherwise be visited upon our temporal lives (v20). The fact that this is so repeatedly laid out in the word of God forms the basis for why these statements must be regarded as having respect to our temporal well-being (time salvation) rather than our eternal salvation, because if our obedience is required for eternal salvation, then salvation is indisputably by works. What Elder Bartley has done here, once again, is solidify the case for why Conditional Time Salvation is an absolutely essential concept for right division without which it is impossible to avoid logical contradictions in scripture. Really? Did you go to be baptized or did baptism come to you and force you into the water? The bible plainly states that there is a salvation in baptism: “The like figure whereunto even baptism doth also now save us (not the putting away of the filth of the flesh, but the answer of a good conscience toward God,) by the resurrection of Jesus Christ:” (I Peter 3:21) So the idea that “we never go to salvation” is utterly false because it is indisputable that for one to receive the salvation found in baptism one must go to it in an act of willing obedience to God. Simply put, baptism is an example of Conditional Time Salvation, not eternal salvation. No man is ever born again (eternally saved) by being baptized or by any other willing act of obedience to God (Titus 3:5); but many are temporally saved by bringing forth the answer of a good conscience toward God by the resurrection of Jesus Christ in the waters of baptism. That is temporal salvation and to the extent that baptism is voluntary, it is perfectly accurate and biblical to refer to such an arrangement as Conditional Time Salvation. 3. That salvation involves man's willing, active, obedience to God. 4. Not all of God's elect are baptized. 5. It follows that Baptism alone proves that there is a Conditional Time Salvation distinct from the eternal salvation wrought by the Lord Jesus Christ at Calvary. Really? How about if your doctor says, “You’ll be dead in a year if you don’t quit smoking.” There’s a timely salvation laid out for you in that statement that is conditioned upon your behavior. That salvation is something that lies within one's power to do it, yet this does not in any way negate that it is a real salvation from temporal consequences. Herein lies the difference in Conditional Time Salvation and eternal salvation; the former is the living doing as they ought in accordance with the word of God, the latter is the dead being brought to life in spite of the fact that they have NOT done as they ought. Both are salvations: the former from this untoward generation, the latter from the eternal condemnation of the wrath of God, and ne'er the twain shall meet. So those in need of salvation are those who need saving? I agree. But it is incredibly important to note that the example of Peter walking on water is a matter of temporal salvation from start to finish and has nothing to do with Peter's eternal destiny. Nevertheless, was Peter saved to eternal heaven in the “salvation” that Christ provided him in answer to his prayer? No. He was saved from drowning - a temporal consequence of sinking. Did Jesus regenerate Peter as a result of Peter’s request? No. Peter’s request was for time salvation, not eternal. That is evident from the context of the story. So once again, this example sets forth a clear picture of salvation in time, not eternal salvation. MORE HERE TO EXPLAIN>.. It is all well and good to affirm that the triple work of Father, Son, and Spirit consists in redemption, regeneration, and resurrection, and we completely agree with that affirmation. But the more probing question where Conditional Time Salvation is concerned is - Does this triple work of Father, Son, and Spirit consist in baptism, obedience to God, joining the Lord’s true church, avoiding fornication, and raising your children in the nurture and admonition of the Lord? Any sober view of the Lord’s people makes it evident that these deliverances (or salvations) do not transpire for ALL of God’s elect in the same way and to the same degree of certainty that redemption, regeneration, and resurrection do for all of God's covenant people. I’ll state this very plainly using just one example: the moment one admits that one’s eternal salvation does not inevitably result in the salvation of water baptism (Luke 23:43), they have admitted that there are additional salvations in the bible that are distinct and separate from eternal salvation that are available to disciples provided they are obedient to gospel instruction. Thus Conditional Time Salvation is an evident, biblical reality in the lives of God’s people and its temporal blessings are related to our wellbeing in this lifetime and are experienced to the degree that we are diligent in our reasonable service to God (Romans 12:1). All of that is true. But baptism is in time, and there is a salvation associated with it (I Peter 3:21), and it does not occur for all of God’s elect family (Hebrews 11). So Elder Bartley's refutation of CTS based on the existence of only one salvation not only falls flat but actually ends up affirming the necessity of CTS in avoiding either logical contradiction or turning a blind eye to the salvation of baptism. I don't doubt that the salvation by Christ's life includes being born again, and passing from death unto life. Nevertheless it does not include baptism in which there is a salvation (I Peter 3:21) and to which a candidate must submit willingly. Elder Bartley’s argument, once again, ends up brilliantly underscoring the precise reason why Conditional Time Salvation is essential to rightly divide the topic of salvation if we are to avoid conjoining human works with the work of eternal salvation. Again, all true but unless this work which God will perform in ALL of his people is the work of willing submission to baptism under the sound of gospel proclamation, then it is evident that this work DOES NOT INCLUDE all aspects of “salvation” described in the word of God, and thus Conditional Time Salvation is sustained. Bartley's affirmations are all very exciting as they speak of a glorious future for all of God's people, but they are also the reason why Conditional Time Salvation is an indisputable biblical reality, because the obedience required for all aspects of one’s deliverance from the consequences of sin in this lifetime is not an ironclad provision of the covenant in the same way that regeneration is. The latter is a monergistic, eternal, and ironclad certainty for all, the former a synergistic, temporal, and variable possibility for all conditioned upon their obedience in discipleship. Here Elder Bartley returns to his dull battle-axe, the old Conditional-is-not-found-in-the-bible argument. Indeed, the word “bible” does not appear in the bible, but only a fool would use this to assert that the bible does not exist. It is true that the term “conditional” does not appear in the bible but this does not in any way establish that conditional blessings in obedience are not found in the bible. Examples could be liberally multiplied because the concept is found throughout the word of God. Every example underscores that Conditional Time Salvation arises from the word of God and one that is essential to rightly dividing the topic of salvation without logical contradiction. Peter’s remarks regarding the law as a burden that their fathers could not bear is made in opposition to Judaizers who were insisting that law keeping was required for eternal salvation (Acts 15:10). Peter's argument does not insist that none of God’s blessings are conditioned on obedience. Indeed, if it did then his command to "save yourselves from this untoward generation" at Pentecost makes no sense at all, neither does his apostolic affirmation of the principle that if the church at Jerusalem would abstain from fornication, they would do well (Acts 15:29). Clearly the salvation wrought by Christ at Calvary does not ensure that disciples will certainly abstain from fornication in the way it ensures their redemption. These observations are precisely why the concept of Conditional Time Salvation exists, because apart from it, salvation as a singular topic in the bible is unavoidably laden with many, many untenable contradictions. In some instances salvation is said to be "impossible" (Matthew 19:26) while in others men are told to “save” themselves. (Acts 2:40). 1. This “day of salvation” (Isaiah 49:8, II Corinthians 6:2) was not the “day of baptism” for all of God’s people given that many were never baptized at all (Hebrews 11) and none are properly baptized until some time after they are regenerated (Acts 8:37). 3. Baptism is conditioned upon one’s willing and active participation. 4. It follows that the unconditional salvation of Isaiah 49:8 is separate and distinct from the conditional salvation to which Peter makes reference in I Peter 3:21 that requires man’s willing and active participation. 5. Given that the salvation of baptism also takes place in time, it follows that Conditional Time Salvation is an accurate moniker for this biblical phenomenon. This is an embarrassingly thick assertion that simply does not follow from his line of reasoning. Is baptism conditional? Yes. Is it a form of “salvation” in the bible? Yes. Does it take place in time? Yes. It is therefore unavoidable that Christian baptism is an example of Conditional Time Salvation. Yes. Now, does baptism occur for all of God’s covenant people? No. (Hebrews 11) Is baptism a requirement of eternal salvation? No. (Luke 23:43) If a regenerate man never submits to baptism will this have any effect on where he will spend eternity? No. (Luke 23:43) Thus the temporal salvation found in the synergistic, willing, obedience of baptism is rightly divided from the eternal salvation by a monergistic, unilateral covenant, and Conditional Time Salvation is fully sustained once again as a perfectly biblical concept; yea, an absolutely essential one if we are to avoid contradictions on the topic of salvation (Titus 3:5 vs Acts 2:40). Yes. Eternal salvation is of the Lord and it is unconditional. But the question is this: Was the salvation from this untoward generation available to David by avoiding adultery an unconditional matter, or was it conditioned upon his obedience to the precepts of God? The eternal salvation of Christ imparted to David most certainly did not guarantee David's sexual purity in the way that it guaranteed David's redemption and glorification. Thus Christ’s work accomplished David’s eternal salvation apart from David’s willing and active cooperation, but David’s salvation from adultery and murder was not guaranteed by Christ’s eternally saving work in the same fashion and to the same degree. God promises to provide the enablement of the Spirit such that a regenerate man is able to avoid sin (I Corinthians 10:13), but God does not forcibly compel man to avail himself of His gracious provision (James 1:14-15). Rather, God exhorts man to obedience and conditions his deliverance from the temporal consequences of practicing such sins on man’s willing compliance. New Covenant salvation does not include an ironclad promise of salvation from the practice of sin in this lifetime. That is an indisputable fact of revelation that is born out in our lives as we continue to struggle with sin until our dying day (I John 1:8, Romans 7). Nowhere does the New Covenant promise that a man will be totally free from the practice of sin in this lifetime. But in many places in the word of God, regenerate men, those who already possess eternal life, are told that they can "save themselves" from the consequences of sin through their obedience to God and be blessed thereby (Acts 2:40ff, Isaiah 1:19-20, Ephesians 4:17-32, Romans 12:1ff, etc.). Did the salvation wrought by Jesus Christ guarantee that the man of I Corinthians 5:1 would avoid committing the sin of fornication? No. Clearly not. Whose fault was it that the man committed this awful sin? Was it God's fault for not monergistically forcing the man to obey by the same eternally saving power whereby He monergistically forced the man's quickening from death unto life? Or is it the man's own fault for willfully and disobediently pursuing his own lusts and not availing himself of God's promised provision to avoid sin? (James 1:13-16, I Corinthians 10:13) Clearly the bible lays the blame at the feet of man for his disobedience. What happened to this disobedient fornicator? He was delivered unto Satan for the destruction of the flesh (I Corinthians 5:5) as a result of his disobedience (I Corinthians 5:5). This is a corollary of Conditional Time Salvation; namely, Conditional Time Condemnation which is the temporal chastisement of God that inevitably comes upon all of his disobedient sons in this lifetime (Hebrews 12:5-17). Did his eventual repentance from that sin deliver or save him from some of the temporal punishments that he received as a result of his sin? Yes. He was restored to fellowship with the church and forgiven for his trespass (II Corinthians 2:6-11). It is no overstatement to say that these six observations are impossible to refute. As such they sustain the reality, yea the necessity of Conditional Time Salvation in rightly dividing salvation into the proper categories of eternal and temporal. Much like Peter's words at the Jerusalem council (Acts 15), these words from Jeremiah 2:13 design the belief that men could gain acceptance with God through law keeping. That speaks of eternal salvation by works. CTS does not suggest that man can gain eternal acceptance from God based on our works or meeting some conditions, not at all. Rather, we insist that God’s regenerate people, who are already eternally saved and eternally pleasing to God in Christ (Colossians 2:10, Acts 10:35), may avoid the temporal consequences of sin and ignorance in this lifetime by living in accordance with the precepts of Christ (John 14:15). This blessing, which is not eternal salvation but temporal well-being, is conditioned upon man’s obedience. Don't believe that? Well, then let's put it to the test. Go out and commit wanton fornication and drunkenness for the next 6 months and let's see if your marriage is saved, if your ministry is saved, if your employment is saved, if your reputation is saved, if your membership in the Lord's church is saved, if your respect in the community is saved. It is readily evident to any sober-minded Christian person that their spirit-enabled obedience to God (I Corinthians 10:13) saves them from the consequences of practicing sin in many ways every day. Consider this: Can a man who is a drunk and a fornicator properly receive the blessing of becoming an Elder in the Lord’s NT church? (I Timothy 3:2) Clearly not. It follows that the “deliverance” or “salvation” unto the office of Bishop is conditioned upon the man’s conformity to the NT standard. I am sure Elder David Bartley was a good and godly man; no doubt a better man that I am, even as a great many if not all of our Baptist forefathers were. Nevertheless, upon close examination, his anti-CTS polemic falls flat on every single point he makes. While he certainly strikes a powerful, authoritative tone, the bluster is unable to conceal the evident flaws in his line of reasoning on the matter of CTS. I can honestly say that the time I have spent examining his argument has only served to further solidify my conviction that Conditional Time Salvation is an irrefutable teaching of the bible that is absolutely essential to rightly dividing the biblical topic of “salvation” without contradiction. Excellent arguments, well ordered and proving the case to any reasonable person searching the scriptures. To me the parable of the sons sticks out as they are both deemed sons but the one who does his father's will has the actual satisfaction of knowing it through the father's evident approbation of his obedience, but they both remain sons. Thanks for taking a moment to leave an encouraging comment. I agree with your observation regarding the parable of the sons. Our ministers have often described this as the distinction between relationship and fellowship. We are related to our parents based entirely upon THEIR actions, whereas our fellowship with them may vary greatly based upon OUR actions. it is I that am encouraged but thank you. Jeremiah 25:7 Yet ye have not hearkened unto me, saith the LORD; that ye might provoke me to anger with the works of your hands to your own hurt.